A superlative cake from a cooking legend. Melt 115g of good quality chocolate, along with a splash each of black coffee and rum, in a bowl placed over a simmering pan of water. The quality of the chocolate is key. High cocoa content, at least over 70% is vital. I swear by Green & Black’s, and this is not the time to skimp on the quality of your ingredients. Also, instant coffee just will not do. As the chocolate melts, resist the urge to stir it too much. Measure 85g each of butter, caster sugar and ground almonds into a pan and, once the chocolate is melted, and you’ve carefully stirred in the coffee and rum, add this to the pan as well. A spatula will be needed to scrape the bowl clean, but not too clean. A cook needs a perk every now and again, and the remnants in the bottom of this bowl are yours today. Gently heat the pan over a very low flame, stirring until the butter has melted and everything is mixed together well. At this stage, disaster may strike and the butter may split. Do not panic, just add a glug of boiling water from the kettle and stir like crazy until the mix comes together again. Take the pan off the heat and let it cool momentarily before stirring in three egg yolks. In a separate bowl, whisk the left over egg whites until stiff. A pinch of salt aids the cause. With a metal spoon, fold the egg whites into the chocolate mixture, and tip the lot into a lightly buttered cake tin, between fifteen and twenty centimetres in diameter. Cook in a very low over, 145 Celsius, for forty-five minutes, or until a knife plunged into the centre of the cake comes out clean. Remove from the oven and allow to cool completely before very carefully removing from the tin. The cake is fragile due to the absence of flour, but has a dense texture and a deep richness. Dust with icing sugar and enjoy with a cup of very good coffee. Since discovering Jill Dupleix's adaptation of this recipe, I've made it twice in a week. Would be interested to know how the original Elizabeth David version compares, it looks great in your photo! 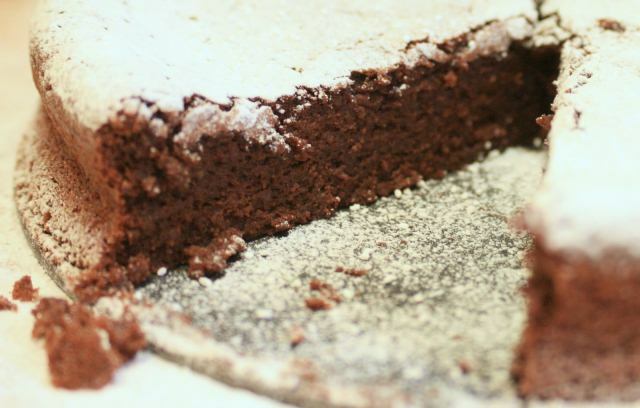 Please note (especially people who cant have flour) The flourless chocolate and almond cake by Jill Dupleix . Her receipe says Quote" turn into a buttered and FLOURED cake tin" .